Every purchase of Lady’s Choice Real Mayonnaise gives you P100 free load for your mobile! Get free mobile load when you buy Lady’s Choice Real Mayonnaise from now till December 2018. To get started, just follow the 5 simple steps below. 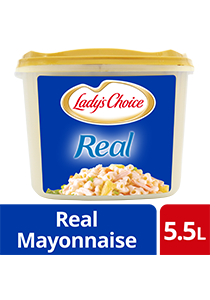 Buy Lady’s Choice Real Mayonnaise 5.5L with the special Free Load Promo sticker. Peel the sticker to reveal the promo code. NAME/ADDRESS/AGE/EMAIL to register for free. Get your P100 FREE LOAD instantly! Hurry, buy these delicious ingredients today to get your instant gift! Only one registered user per mobile number. Subjected to PhP 2.50 per text. Postpaid subscribers who win instant load will be able to nominate a prepaid number to transfer the load prize to. A subscriber can win an instant prize more the once for the duration of the promo. However, he may only win 1 instant prize per day. View full terms and conditions.